I love it when you find unexpected items at unexpected places. A few examples from above. A new line of spray paint in the coolest colors at Michaels (this one is sort of an expected place to find spray paint colors but I have looked for years to find a line of colors other than Krylon and close to mi casa. One for him and one for me. Why not buy a matching shirt in the little boys section at Wal-Mart....shhhh... it was only $9.96 but looks much more expensive. Plus the color is a beautiful corally peach color. A local grocery store (Fry's) apparently sells blue and white garden stools..very unexpected. $29 to boot. After seeing this home in House Beautiful I always feel there is a need for blue and white something. My picture does nothing for the above floor lamp but I can assure you it is gorgeous in all of its chromed out faux bamboo glory. I usually do not shop Pier One so the lamp came as a pleasant surprise. It looks expensive and I think the lamp shade may have a subtle python pattern. Who leaves Home Goods with only a pack of Jelly Bellys in hand? I didn't even know Home Goods sold Jelly Bellys but they came in handy for a late afternoon pick me up. Would you think I was a sicko if I liked the buttered popcorn flavor..everyone always seems to disapprove. Little late but hope you had a great weekend!! GET OUT OF TOWN with your sleek, super stylish, vintage console table being used as a fabulous nightstand!!!!! Why do you keep so many things a secret!? I looked at the pics before I read and I totally thought that image was about the table. I was like, "shirt?? what IS she talking about...?" lol. And I love the bench. And I love that you'll cover something unfinished with beautiful fabric until such time you decide to get it done. FAB. Can't wait until you do a house tour. I "fish" for buttered popcorn and toasted marshmallow. Been searching for garden stools like that for months! Wish we had that store here in Austin. Thank you for being a fan of my favorite Jelly Belly flavor! wow on those garden stools. YOu could buy their whole stock and resell them for 3x that! fun things, and why is there candy everywhere? 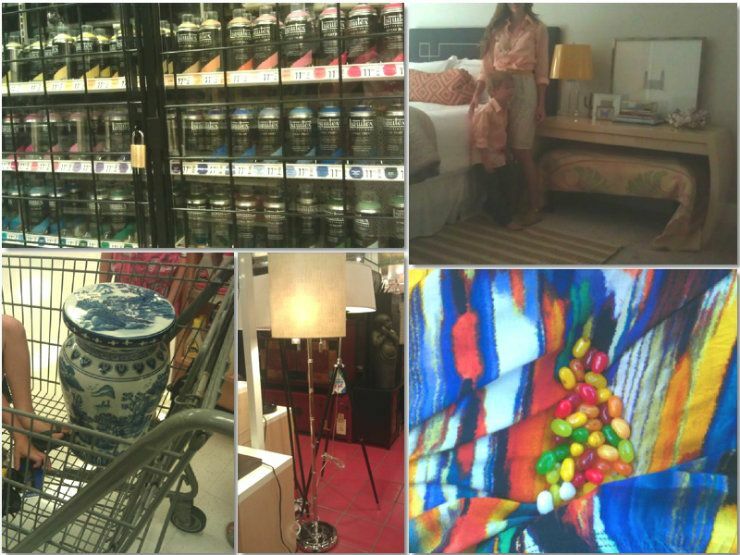 I love jelly beans, at Home Goods, no less. bargain. I love the Pear ones. Seems like you are good like to use china, but for me i really cannot do that because i am afraid to break them...And when i meet with the Women's leather tote handbags at http://www.cwmalls.com i found it match with me!